POMEROY — Local attorneys Christopher Tenoglia and Adam Salisbury announce their recent association, Tenoglia & Salisbury Law Group, LLC. 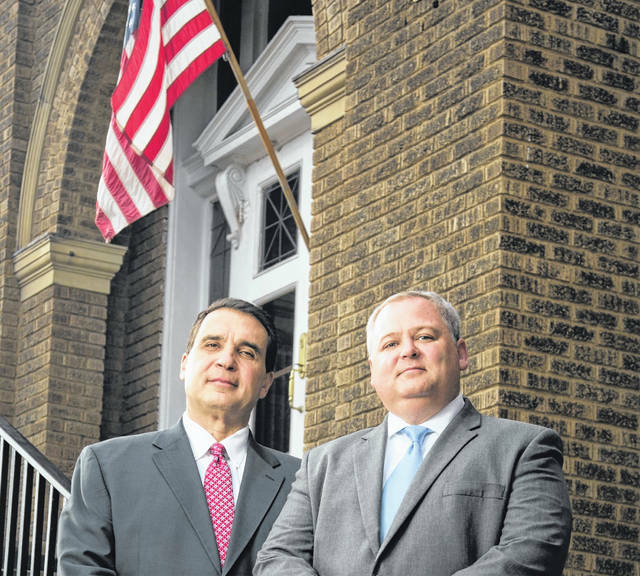 For many years located in the Carnegie building at 200 East Second Street in Pomeroy, Tenoglia has practiced law and also made his home in Meigs County since 1991. Salisbury, in practice since 2005, was most recently employed as the Gallipolis City Law Director and Solicitor. Adam is the son of Steve and Shirley Salisbury of Gallipolis and the grandson of Dorsel and Phyllis Larkins of Long Bottom. He and his wife Missy (Smith) have enrolled their children at Southern this fall. In addition to their general law practices, Tenoglia and Salisbury have for several years been helping local families file claims for asbestos related lung cancer and mesothelioma as well as other types of cancer associated with industrial carcinogens. Tenoglia and Salisbury currently represent local men and women who have worked in plants and factories in the area, including Kyger Creek, Phillip Sporn, John Amos, Gavin, Goodyear Apple Grove, Dupont, Shell, Ashland Oil, Union Carbide, Mountaineer Power, and Kaiser Aluminum as well as several local retirees who worked in similar plants and factories around the Ohio Valley. Tenoglia and Salisbury state that cancer victims should contact them directly to find out if they may have a claim. Hundreds of millions of dollars have been set aside in private trusts to be used as compensation for the victims and families of those afflicted with asbestos related cancers. Tenoglia and Salisbury have had success representing those in union trades such as insulators, pipefitters, boilermakers, millwrights, welders and glass workers including a certain Meigs County case in which Tenoglia successfully litigated what was, at that time, a record setting mesothelioma settlement. Tenoglia and Salisbury also said that they have successfully reached settlements for smokers and also persons whose family members were exposed to asbestos at work and brought asbestos home to others on their clothing. They have even helped persons who were previously compensated for asbestosis. Tenoglia and Salisbury also stated that certain types of cancer may take up to forty years before the victim experiences any symptoms and that workers in plants, factories, refineries, mines, schools and railroads before 1980 are at particular risk. If you would like Chris or Adam to investigate whether or not you may have a claim, they welcome your call at 740-992-6368 during business hours or anytime through website at www.taslg.com.